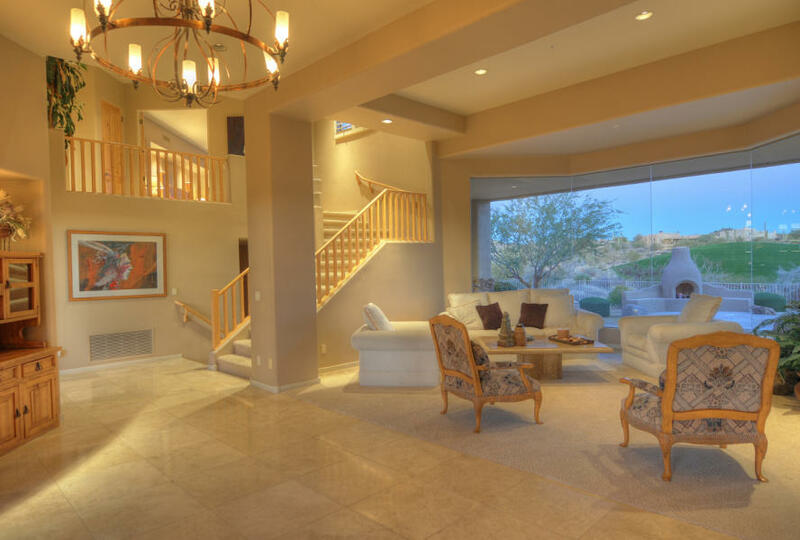 Luxury Home AZ – ARIZONA LUXURY HOME REAL ESTATE EXPERTS – Phone Jeffrey Cline at 480-442-8395. See a Complete LISTING BLOG with all the facts you need on this home, the neighborhood, schools, shopping, location, taxes, construction and utility information. 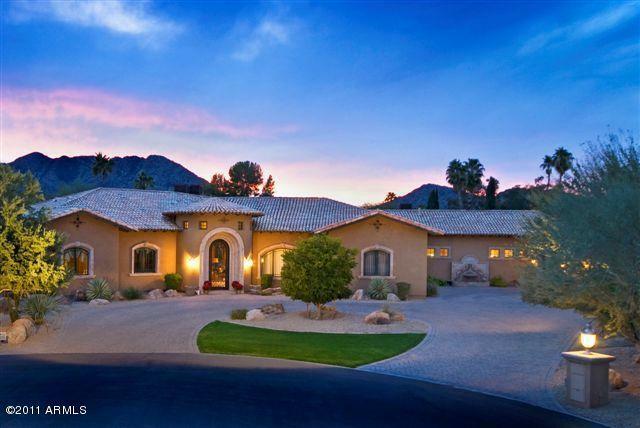 Amazing custom home on 1.9 acres inNorth Scottsdale. This beautiful home has 5 bedroom with a casita, an office has a separate entrance to front courtyard, Travertine throughout, circular brick paver driveway and custom gate. 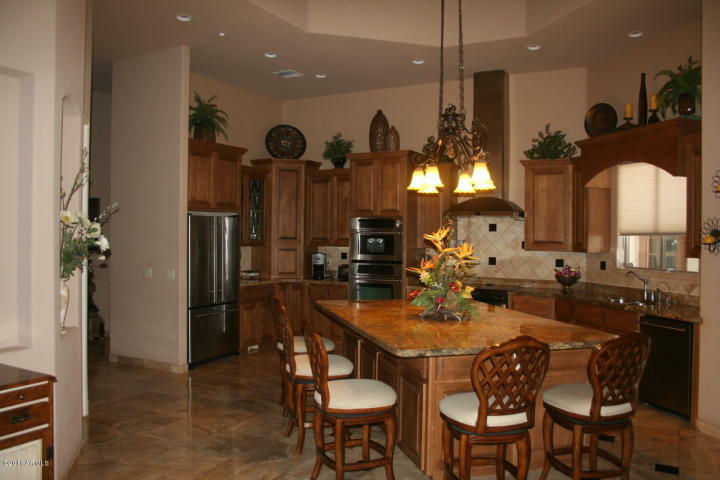 The large kitchen has a beautiful oversized island with seating and an open floor plan that is great for entertaining. Master suite complete with sitting room, huge master bath and closet. Mountain views are breathtaking. 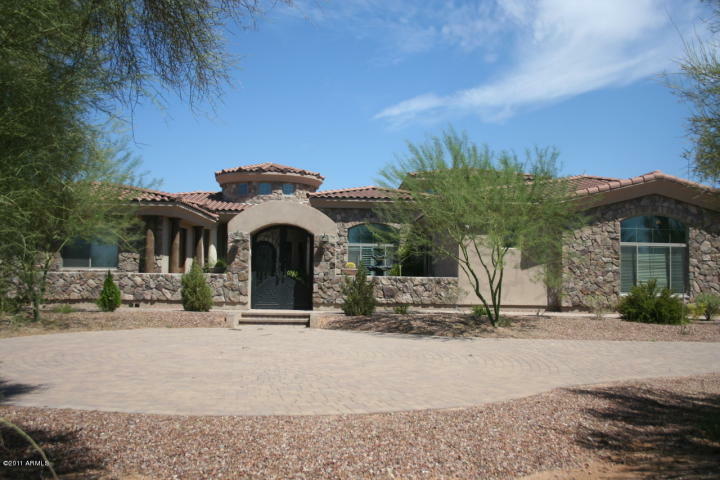 Beautiful custom home with many upgrades on 1.9 acres inScottsdale. Custom details throughout. 5 bedroom with a casita. One bedroom currently used as an office has a separate entrance to front courtyard. 4.5 baths. Travertine throughout. 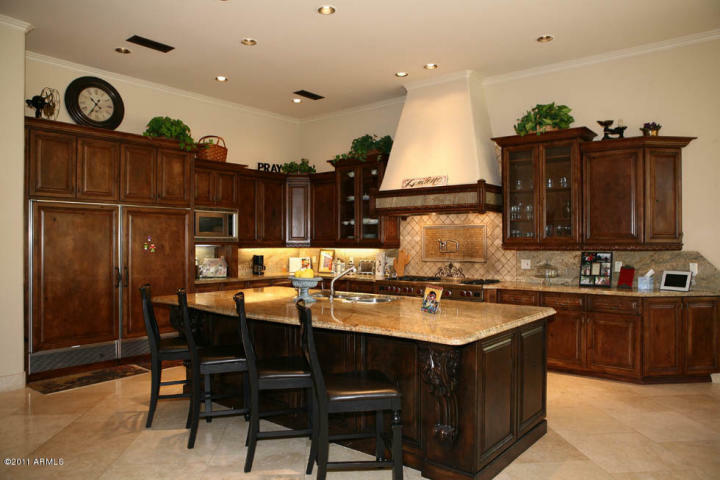 Huge custom kitchen with granite, extra large island with seating. Dining room, living room, HUGE master with sitting room, huge master bath and closet. Mountain views. North South Exposure. 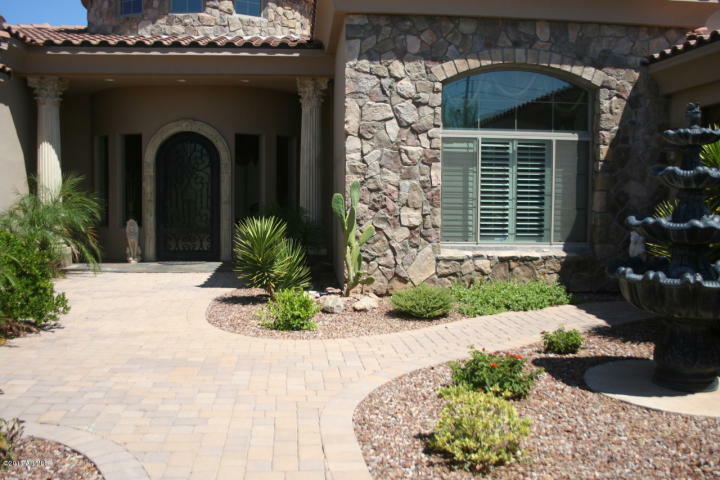 Circular brick paver driveway. Stone work, custom gate. Many upgrades. So much more!! Must see property. Pride of Ownership. 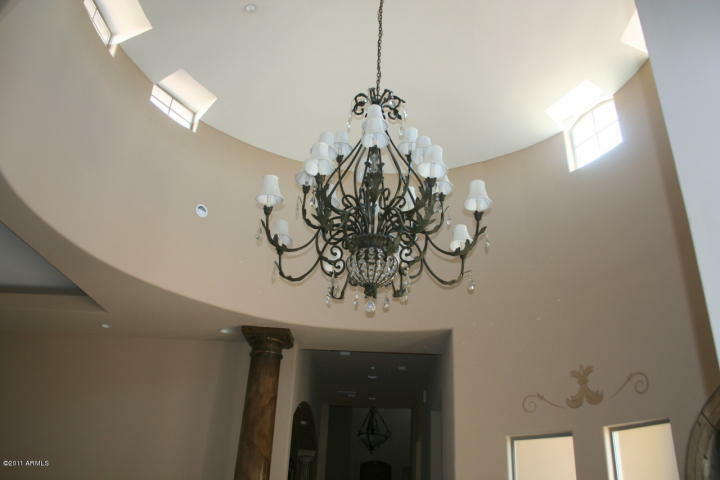 CLICK HERE FOR A COMPLETE VIDEO TOUR OF THIS AMAZING HOME IN LOST CANYON, North Scottsdale, AZ. Click Here >> Not Available Today, Check back Soon! Let’s make your offer and this incredible house may be your new home! Troon North Scottsdale, AZ. North Scottsdale’s BEST Realtor! REDUCED $60,000. 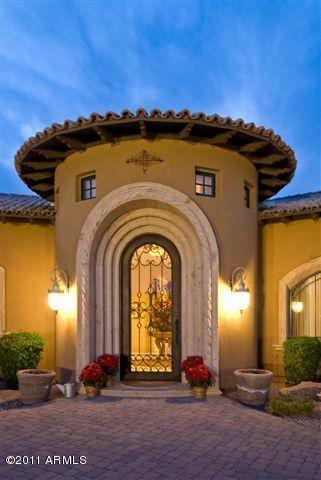 Located in the exclusive Pinnacle Golf Course, Troon North, Scottsdale, AZ. 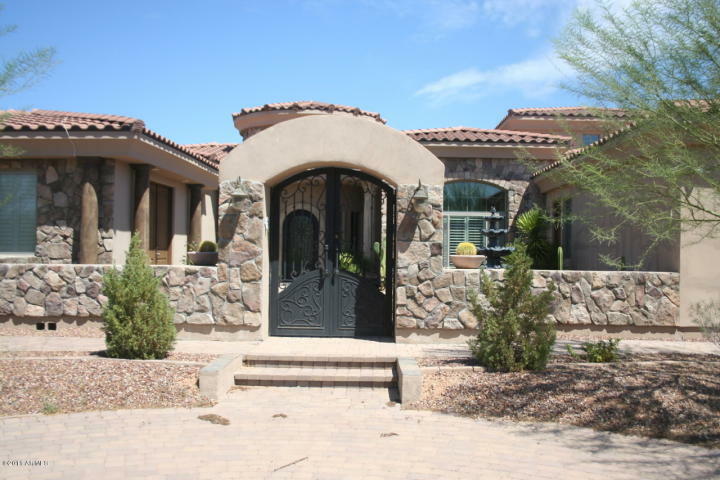 This amazing home is located at end of a beautiful Sonoran cul-de-sac with a 300 foot driveway on an acre and a quarter lot. Perfectly situated on the signature ”Pinnacle” 10th Green, lots of large sized glazed glass opens up with views of multiple fairways, the 10th Green, and Goldie Brown Butte. The best sunsets, multiple view decks, 24 inch flooring, many upgrades through out. 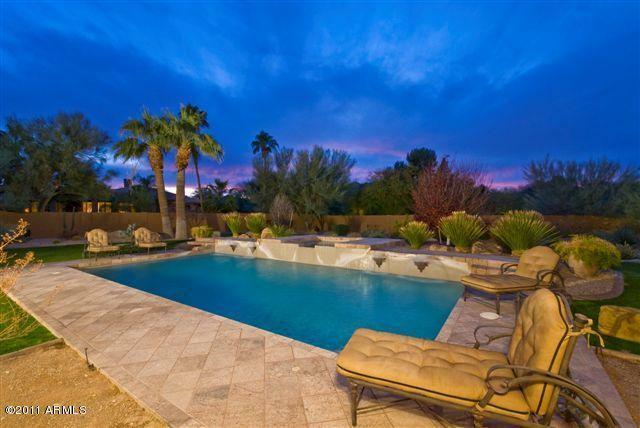 Very exclusive North Scottsdale Troon North neighborhood, home next door listed for sale over $4 million! This home is a real deal! 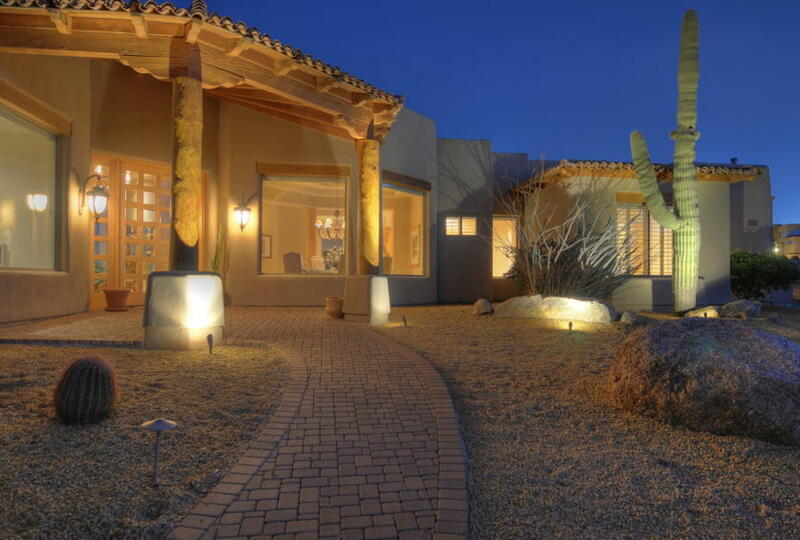 Surrounded by the beauty of the Sonoran Desert, Troon North is a special place. Scottsdale’s two newest golf courses can be found at Troon North Golf Club, which hold the top golf ranking in Arizona! Tom Weiskopf led a two-year project, which transcended typical course renovations. He created an entirely new playing experience. 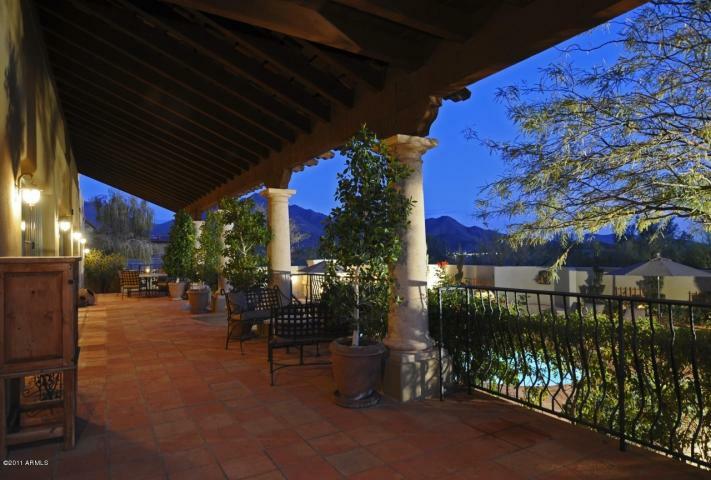 This stunning custom home is situated in the heart of Paradise Valley and in one of the most desirable Public School Districts. 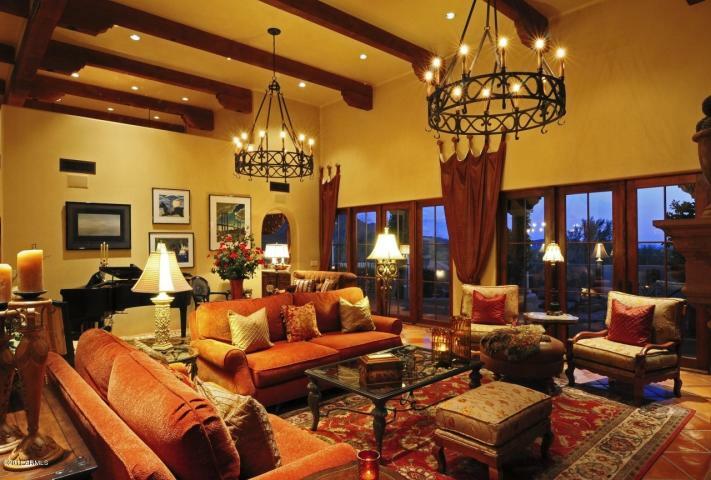 This Tuscan home has beautiful custom iron work on the front entry door as well as the ele-gant wine room, 3 fireplaces and a Canterra Fountain in the courtyard. You will love the open floor plan for en-tertaining or the cozy dining room for a more intimate gatherings. Master suit is complete with his and her re-strooms and 2 must see walk-in closets. 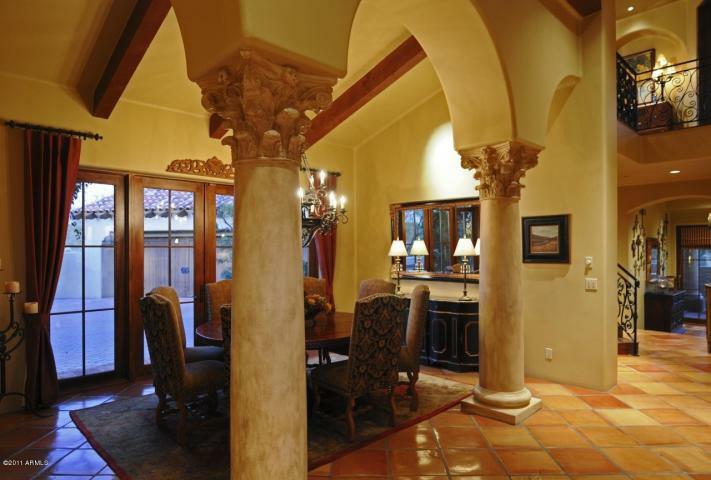 Beautiful Custom Tuscan yet not heavy an open entertaining floor plan. A bit contemporary on the inside. Features a cozy den area, custom iron work wine room & front door. Lovely street appeal auto courtyard with Can-terra Fountain. Mist system front and back. 5 bedrooms + office 6 baths. Master bedrooms includes his and her toilets 2 huge must see walk-in closets. Movie theater room is one bedroom. 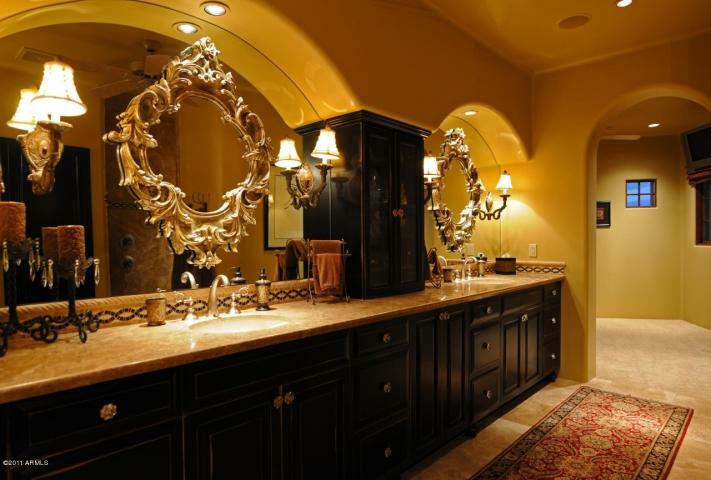 2 powder rooms, 3 Cantera fire-places. 24” Travertine floor/carpet. DC Ranch North Scottsdale, AZ. taxes, construction and utility information below. Custom Home in DC Ranch; Warmth and welcome exude from this great DC Ranch floor plan with breathtaking mountain views and city lights. Impeccable finish and attention to detail both inside and outside with many custom features. 16′ high wood beams ceiling, barrel arched hallways, custom drywall, factory tinted windows, alder wood built in and doors, North South cul-de-sac lot and a 4 car oversized garage. Warmth & welcome exude from this great floor plan with breath taking mountain views and city lights. Impeccable finish & attention to detail both inside & outside with many custom features. 16′ high wood beam ceiling, barrel arched hall-ways, custom drywall, factory tinted windows, alder wood built-ins & doors and lighting system. A 4 car oversized garage. The den could easily be another bedroom & the office has a private entrance. The home shows as a model on a North/ South cul-de-sac lot. You are currently browsing the archives for the LISTINGS category. 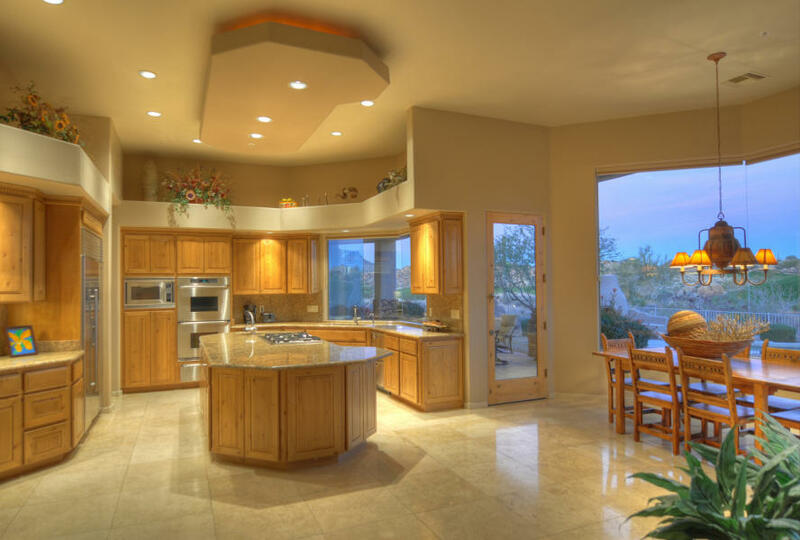 ‘LIKE’ on facebook for the Latest Info on Arizona Luxry Homes! The views expressed herein do not reflect the views of Caliber Realty Group, LLC.